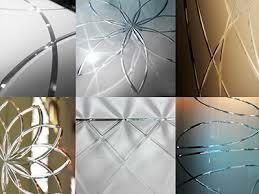 Tempered glass designs - Tempered Glass Looking for Tempered Glass? The variety of materials and textures of modern models makes it possible to choose the design for any interior design. Giovanni Glass company is offering a number of designs, and the most popular are the following ones. Sandblasting. A stream of air with particles of sand processes the material under high pressure. Prints after processing may have a different depth. Engraving. 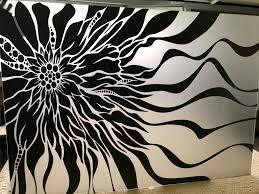 It is applied on glass with modern laser and diamond machines. Sometimes they use special pastes, which are based on acids that cause glass erosion. Also spray paints are used to simulate engraving. Photo printing. A special pattern printed on a UV printer is placed between the glasses. It is resistant to moisture, aggressive environment, fading. Fusing. It is made in the form of a mosaic of colored glass. Colors must be harmoniously combined with the overall stylistic design of the bathroom. Art painting. Performed on glass with the use of special waterproof paints. Tinted glass. Stylish and original tinted glass doors can refresh any interior. Important! It must be remembered that the use of tinted and colored glass require good lighting in the shower room. Our company will help you to make a right choice.